Mirabel Vineyards, which has just released its 2016 Pinot Noir, is transforming from a virtual winery to a land-based winery. The winery, based on a vineyard in northeast Kelowna, has just received its license. Proprietor Doug Reimer plans a production facility at the property, along with an appointment-only wine shop. Going forward, the wines will be made by David Paterson, the winemaker and general manager at Tantalus Vineyards. Mirabel, which has also launched its own wine club, produces wines only from Chardonnay and Pinot Noir, including a Pinot Noir rosé and, coming next year, a sparkling Pinot Noir. Mirabel Vineyards is operated by Doug Reimer and his wife, Dawn. The winery came about after the Reimers, members of a leading Canadian trucking family, purchased this Kelowna property in 2005 to build their dream home. The property is on a sun-bathed slope above the Harvest Golf Course and, at the time, was an apple orchard. They cleared the apple trees to make room for a vineyard, having decided that vines are more attractive that trees. They had consultants analyze the soils and recommend grape varieties. In 2006, they planted most of it with three clones of Pinot Noir. The final one and a half acres were planted with Chardonnay in the spring of 2018. For a number of years, the Reimers sold their Pinot Noir grapes primarily to Meyer Family Vineyards and to Foxtrot Vineyards, two of the Okanagan’s leading Pinot Noir specialists. It gave the Reimers the opportunity to assess what could be produced from their fruit. 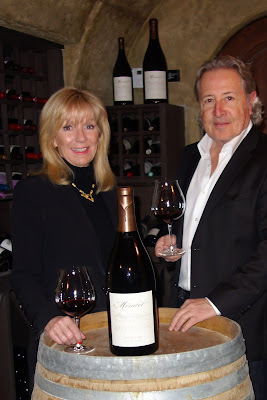 The first Pinot Noir from Mirabel was made in 2015 and subsequently was released at $70. Until now, the Mirabel wines were made for the Reimers at Okanagan Crush Pad winery and by OCP winemaker Matt Dumayne. OCP operates a custom crush and winery incubator business. David Paterson, who joined Tantalus in 2009, is a Canadian-born, New Zealand-trained winemaker. Tantalus, also on a vineyard in East Kelowna, is renowned for Riesling but has a rising reputation for Pinot Noir and Chardonnay. Here are notes on two recent releases. Mirabel Rosé of Pinot Noir 2017 ($30). This wine is packaged in an unusual but attractive bottle with a glass stopper. The wine begins with a delicate rose petal hue and aromas of strawberry and raspberry. It has surprising weight on the palate, with flavours of strawberry. Fresh acidity gives the wine a clean, refreshing and dry finish. 92. Mirabel Pinot Noir 2016 ($70 for 450 cases). This elegant and deeply flavoured wine has aromas and flavours of cherry with touches of raspberry, spice and very subtle oak. The freshness of the palate reflects the 2016 vintage, an excellent one for Pinot Noir. The seductive flavours and the silky texture linger and linger. The good acidity gives this wine the ability to cellar well, if you can keep your fingers off it. 96.